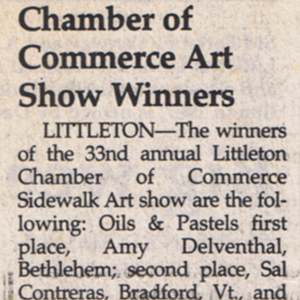 LITTLETON – The winners of the 33rd Annual Littleton Chamber of Commerce Sidewalk Art Show are the following: Oils and Pastels First Place, Amy Delventhal, Bethlehem; second place, Sal Contreras, Bradford, VT, and third place, Dennis Leblanc, Auburn, Maine; honorable mention, Marni Lawseon, Temple, Maine. Photography, first place, Roger Irwin, Maidstone, VT; second place, Jim Mauchly, Fairlee, VT; and third place, Chris Adams, Errol; honorable mention. Kathy Stevens, Lisbon. Crafts, first palce, Lisa Labnon, North Conway and Miami, FL; second place, Kim and Donna Stamper, Grantham; and third place, Sandy Raynor, Lyndonville, VT; honorable mention, Don and Linda Marcille, Corinth, VT.